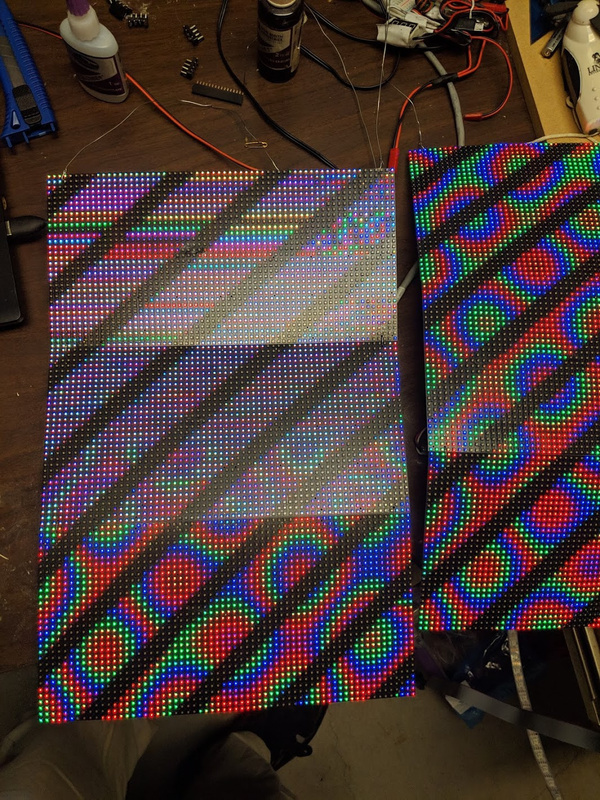 Panel chaining with ESP32 not working well when many pixels are on? Hi @Louis. I’m using 96x32 with 3 panels. It works fine, until I connect the output of the first 3 panels into the next 3 to get mirroring using whatever is shifted out for ease of wiring and not having to split the original cable in 2. I didn’t expect it to be a power problem because I injected power on panels 1 and 4 and only panel 6 (and sometimes 5+6) was having problems. Turns out the problem was power nonetheless. My bench power supply is only 5A and that’s not enough. I guess because of how the rows get refreshed one after another, somehow only row 6 (and sometimes 5) were impacted. More power fixed the issue. Sure, I guess I do have 12288 pixels total, but I expected them to use less power than my 1536 neopixels, but turns out they’re about the same.